Welcome to the Priory of St. Wigberti! Werningshausen, about 13 miles north of the town of Erfurt, is a village of about 800 inhabitants with a nice church. This is due to the activities of a young parson who came to Werningshausen in 1973. The church was then going to ruin and was to be pulled down, as had been done to the churches of the neighbouring villages. He founded a community the members of which repaired the church of Werningshausen and 20 other churches in the region. This was a signal to the villagers as well as to the authorities of the established church. The members of the community had decided to live together according to the rules of the order of St. Benedict. As monks were unusual in the evangelical church it took lengthy discussions before the rules were approved in 1987 by Bishop Dr. Werner Leich, who had watched the work of the community with sympathy from its beginning in Hermsdorf in 1967. At the same time Pfarrer Franz Schwarz was appointed prior of the Fraternity of St. Wigberti. After much work and with the help of many donations the brethren settled down at Werningshausen in their own convent buildings which have been consecrated in 1992. Ora et labora: At present there are 8 brethren living in the convent, aged between 23 and 65 years, 2 of them being Roman Catholics. Their rule of conduct “ora et labora” is closely connected with their engagement in the ecumenical movement. Four times a day they meet for canonical hours and on Thursdays a convent mass is held. For many of the Christians in the village as well as those who live not too far away Werningshausen means a shelter in the wilderness: mass on Sundays and parish activities are well attended Besides their pastoral duties the brethren work on the monastery area with its wafer bakery, its souvenir shop, and its guest-rooms. There is also a group of young people who keep close contact with the brethren and their activities (Oblatenkreis) and the Association of Friends who give financial aids. In this way the brethren are kept in touch also with the difficulties and troubles of the world outside the convent, which itself seems to be well protected by God. Paying guests give financial support to the activities of the Fraternity and are always welcome, if for passing some quiet days but may also take part in the convents program of the day. Accommodation and 4 meals a day may be provided in 4 bedrooms and a guest’s sitting room on a contribution of Euro 35 per person per day. Booking written or by phone. The association was founded on an idea of the former bishop Dr. Werner Leich in 1994 to assist the Fraternity in financial and spiritual matters. 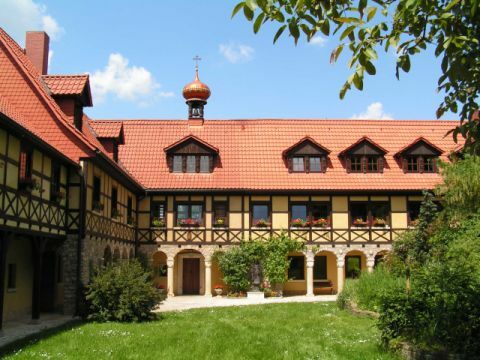 The members of the Association pay a contribution of at least Euro 16 a year and meet at Werningshausen once a year, in August on St. Wigbert’s day, for a general meeting. By the end of 2003 there were about 210 members. New members are always welcome. Heaven bless them. to Weimar (about 15 miles to the Southeast), the “City of Goethe and Schiller” with the Buchenwald Concentration Camp Memorial not far away. About 1 hour by car it’ll take to reach the winter sports centre of the Thuringia Forest at Oberhof, a detour to the beautiful town of Gotha is recommended. Eisenach with the Wartburg Castle isn’t more than 32 miles away.